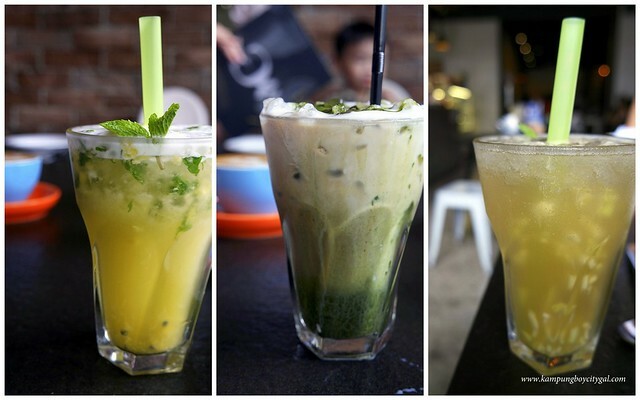 Ground Eatery is not just another predictable hipster cafe. 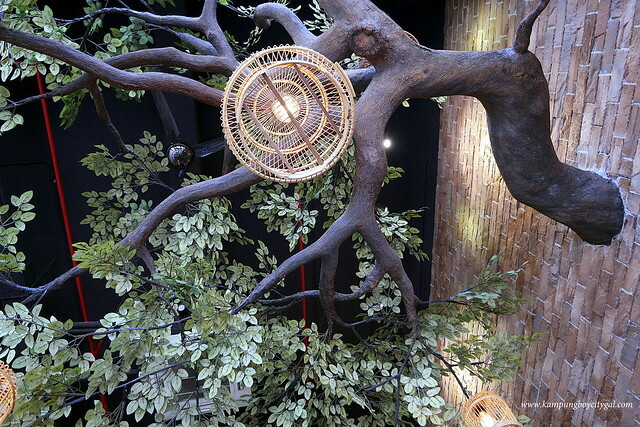 There’s no old-fashion light bulbs, exposed air conditioning ducts, menu printed on distressed paper and stuck to a clipboard, black walls and all that common traits that you can find in a hipster hangout. Instead, the interior is a breath of fresh air, with plenty of greens around. Knowing the Kwong sisters from their Gyukingu days, I can see that they are very passionate about food. 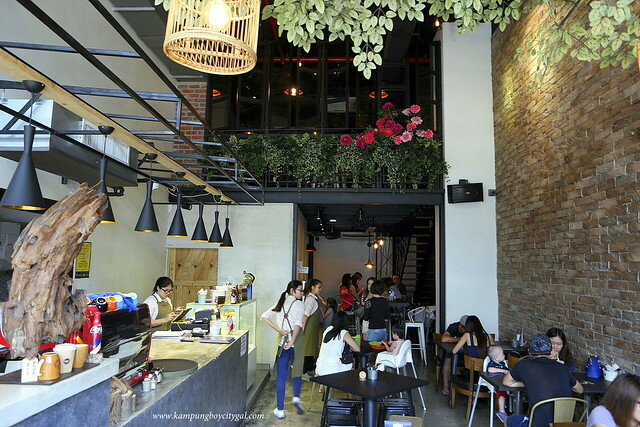 They have spent months designing and refining the menu in Ground Eatery. Hence, we have to drop by here on a Saturday afternoon even though Puchong feels like the other side of the world (to us). 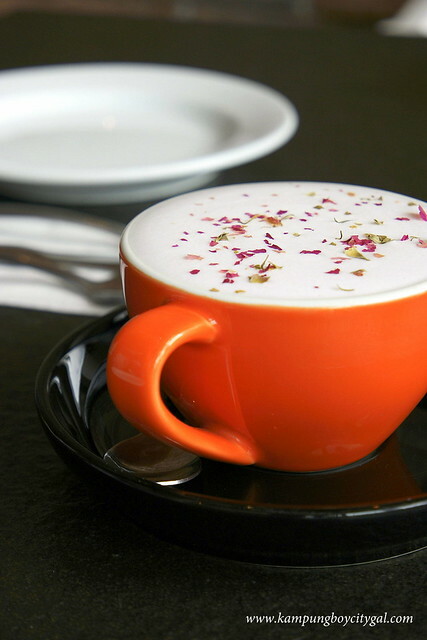 There’s no lack of creative drinks on the menu such as the rose latte and matcha soldier – combining 2 of my favourites, matcha and espresso. So good!! We started off with the shroomies salad. Thanks for making dull salads not so dull anymore! 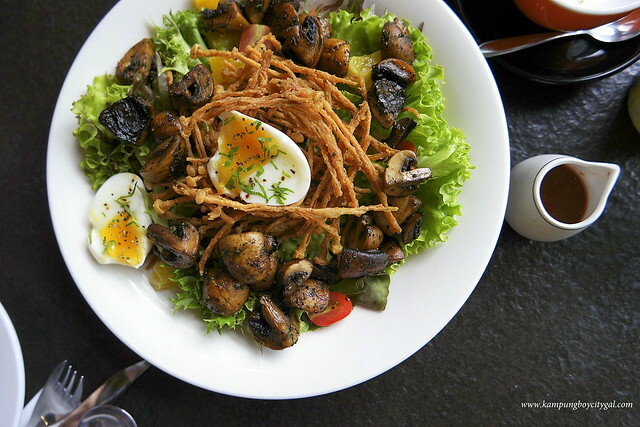 In fact, it was an interesting combination of tangy dressing, crispy enoki mushrooms, bouncy button mushrooms and runny yolk. Roasted Char Siew + cod fish roe sauce + onion + seaweed + mozzarella cheese. 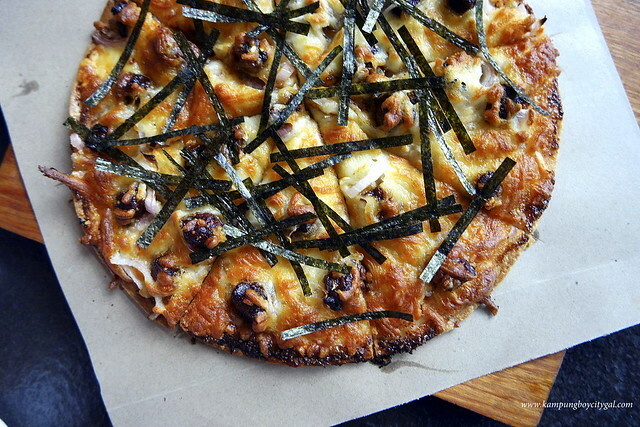 Think thin crust pizza topped with char siew slices, plenty of cheeses, seaweed and a sweet savour sauce! 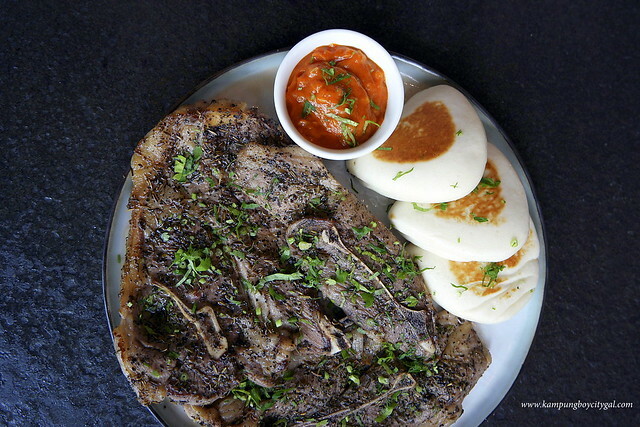 Tender Australian lamb shoulder + Gua Bao + Homemade Peanut Sauce. I’m not a big fan of lamb so I can’t really comment on that. However, I love the special peanut sauces and the soft fluffy guabao. Runny eggs wrapped with mined meat + mixed salad. I spotted these on Ground Eatery’s FB page, and immediately I knew that we need to try the dino eggs! 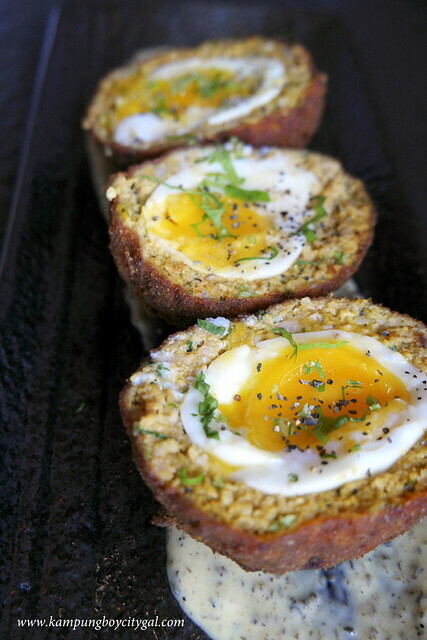 Inspired by Scoth eggs, Ground Eatery uses a different approach by incorporating Asian spices into the minced meat. The eggs were done perfectly too, almost like a 63 degree celsius egg. SO yum! I love this pasta. It was buttery, tangy, spicy, sweet all in one. 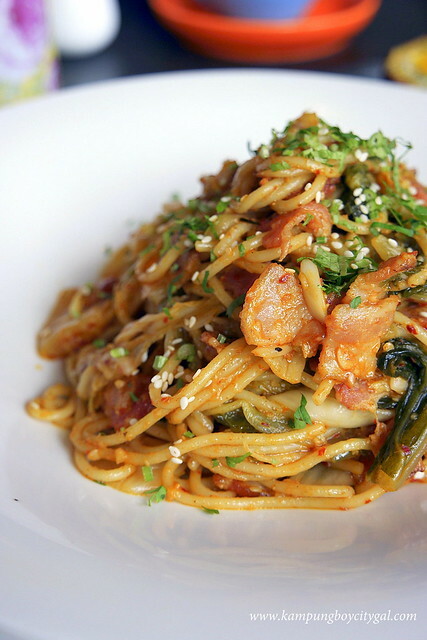 Japanese kimchi is used, instead of the usual Korean ones because Japanese kimchi is sweeter and milder in taste. Pan fried gyoza + pasta + crispy shredded ginger + light tomato broth. Made especially for our little toddler Mini C, the pasta was really delicious. 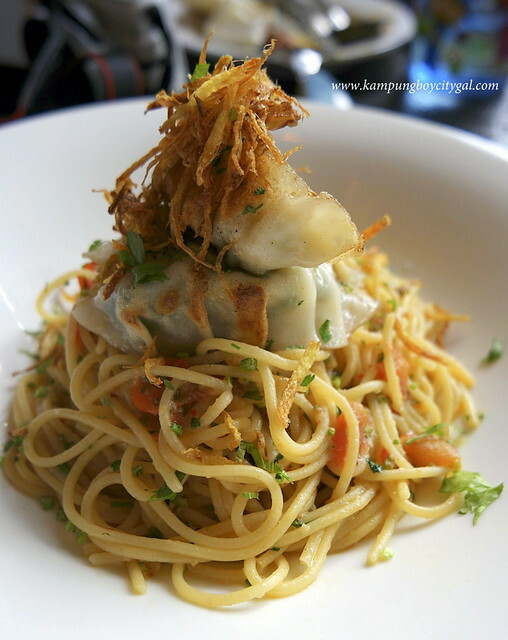 It is an Asian inspired pasta with shredded ginger and gyoza, so interesting! 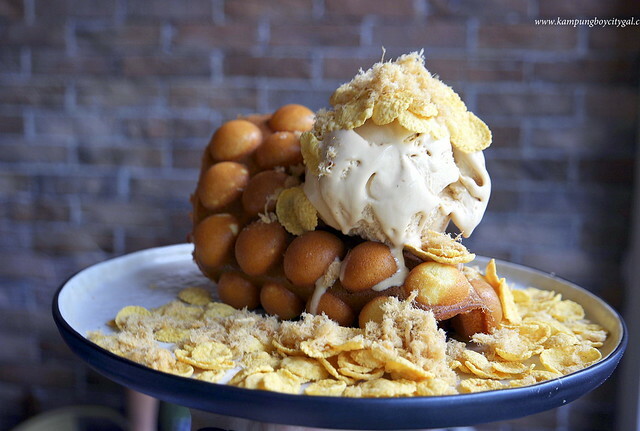 Gai dan zai/HK eggettes is like the biggest food trend right now. I love how Ground Eatery combines sweet and savoury flavours, crispy and soft textures into one single plate of dessert. Especially love the berry compote and lavender ice cream, very refreshing. 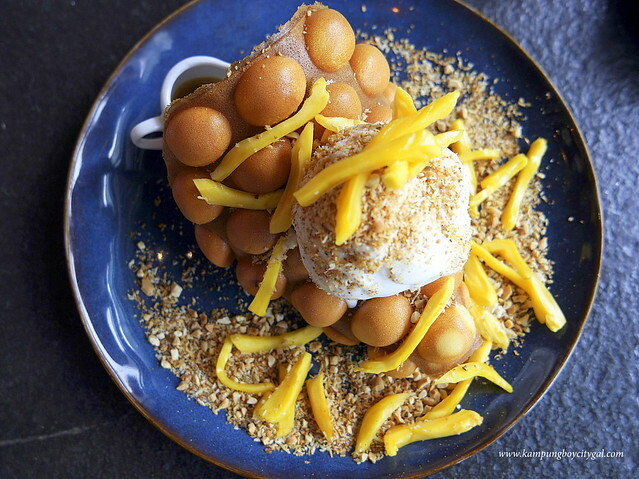 Jackfruit + Toasted Coconut + Toasted Peanuts + Coconut Artisan Ice Cream + Salted Gula Melaka Caramel Sauce. A pure sweet indulgence, I love the very malaysian combination of jack fruits, coconut ice cream and gula melaka. However, the coconut ice cream is a tad too sweet for our likings, and it is not coconut-y enough. Thanks to Shirley for having us. It was an epic brunch session and we enjoyed ourselves very much. 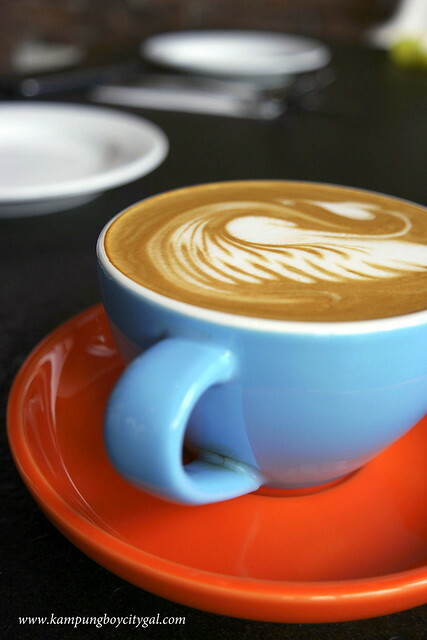 So glad that we are able to introduce another cafe with not only great ambiance, but also great food and great services.